It’s that magical time of the year again! The kids will soon be back at school and you will have your house to yourself. No more running after the kids and yelling for them to be careful, no more cleaning of spilled food on the floor or the table, no more messy baths. You can have your time dedicated to organizing your home and cleaning it, and remembering some facts from school so you can help with the kids’ homework. It is wise yo Organize your kids school supplies and teach them to be responsible as well. Use this time wisely and you can improve your kids’ rooms. If you do not like the way their school supplies are organized, or the lack of organization, you can dedicate some of your free time to improve it. Dedicate time and give it the look and order you desire. Teach the kids to be organized instead of leaving your children to just scatter their supplies in the drawers or containers. If you need to go and buy some new stationary supplies, check out companies like Office Monster who do great deals. My friend uses them to supply her office with stationary and she loves using them. There is no need to worry, if you do not feel like spending a lot of money, you can easily improvise. For example, as we all know kids love drawing and especially the young ones, who also have to practice their writing. They probably have a ton of markers, pens and pencils, and other arts and crafts, and writing supplies. These things seem to never be in order, but you can easily fix that. If you do not feel like buying tens of new pencil cases, what you can do is re-purpose some of your house items. Things like old tin cans, mason jars, bottles, even muffin tins or some old cardboard boxes (big and small), all of these items can be reused in a way to help you organize your kids’ school supplies. Separate their markers, pencils, pens, glue sticks, paint brushes, etc. If you have more than one kid, you can organize by putting labels with their names on each one, so that they do not fight and each kid has their own jar of markers and learn to be responsible. You can be creative and decorate them in many other ways so that the jars or tin do not look ordinary – use paint, stickers, labels, ribbons whatever tickles your fancy. If you have a lot of drawers that are filled with scattered school supplies such as post-it notes, tape, glue sticks, rubbers, paper clips or anything else, what you can do is make your own dividers to put into the drawers and organize the small items. You can use again a muffin tin, an egg carton – for the smallest items, or you can get a cutlery divider to put in and use for school supplies organizer. If you have an old hanging shoe organizer- that too can be used for your kids’ school supplies. 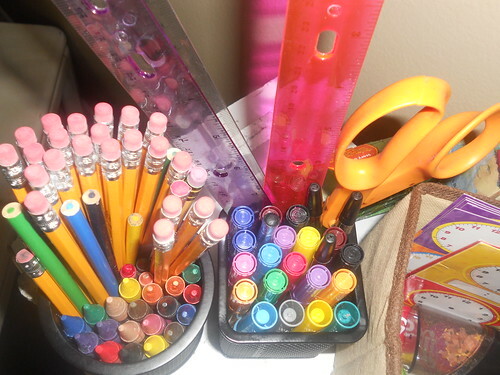 Everything can go in it – calculators, rulers, pens and pencils, water colors, staplers, scotch tapes, glue sticks, etc. Separate the drawers for the books and notepads. There are a number of ways you can separate them – by category, by subject, by alphabetical order. Organize the books and notepads in a way to be easily seen and found. Cleaners London suggests you could even use magazine folders or any other similar organizer for the books and the notepads. There is a way that is probably the easiest, but it is also the laziest in my opinion, and it will not bring any aesthetics into the kids’ room, or any pleasure in them when they use their school supplies – which should not happen – but, hey, whatever works for you. And this way is to buy plastic containers and fill all of their school supplies, separate them by category and stack them on top of each other, with labels so that your kids know where to look for when they need something. Do you think you have some of those jars, lets check them out now, right? Leave us a comment on your organizing skills and utensils that you use while cleaning and organizing. We will enjoy them all.